They say in Vegas, the house always wins… except when it doesn’t, in which case, it gets literally blown up. And when that happens, everybody wins, because we get to see massive, iconic buildings imploded for our amusement (and/or to make space for the next big implodable structure). The trend has slowed down recently with spots like the Sahara and Bill’s Gambling Hall being gutted and renovated without the benefit of dynamite (ugh), but it’s just a matter of time before another demo-job takes place. Until then, let’s look back on the best ones in Vegas history. How it looked: Like a fireball. Emotional impact: Medium. The Dunes struggled for years and had a reputation for being kept afloat with mob money. Fun fact: After the implosion, Bellagio construction workers found four bags of Dunes casino chips mysteriously buried at the site. How it looked: Freaky. Like a spaceship got sliced in half. Emotional impact: Medium. The 31-story hotel was once the tallest structure in Vegas, but had financial problems and ownership changes over the years. What’s there now: A 22-acre parking lot for the Las Vegas Convention Center. Fun fact: The implosion was used in the cinematic implosion that was Tim Burton’s Mars Attacks!... here’s a bonus video of how it looked on the big screen. How it looked: Like it rolled over on its side. Emotional impact: High. One of the classic Vegas resorts and home of Frank Sinatra, Dean Martin and the rest of the Rat Pack. What’s there now: The Venetian. Fun fact: Due to high sentimental attachment to the place (it was considered by many to be the birthplace of the Rat Pack), chips from The Sands are going for as much as 30 times their face value. How it looked: Smokey. Some of it was still standing after the implosion and had to be removed later by construction crews. Emotional impact: Medium to low. The resort was kind of on its own at the South end of The Strip, and away from most of the action. What’s there now: The much busier Mandalay Bay. Fun fact: The implosion was done on New Year’s Eve as part of a massive fireworks celebration. Don’t ever say Las Vegas isn’t efficient. How it looked: Awesome. It was done during the day, so you get a crystal-clear view of the action. Emotional impact: High. This was where Elvis married Priscilla. Enough said. What’s there now: Another Aladdin (yawn) took its place, but was eventually transformed into Planet Hollywood. Fun fact: Word has it when the New Aladdin opened up after the implosion, professional gamblers and card counters took advantage of the inexperienced gaming staff and made off with tons of cash. How it looked: Weirdly clean and neat. Emotional impact: High. Its showroom hosted major stars from Liberace to Cher. When Howard Hughes was told to leave after renting out the top two floors, he decided to just buy the resort. What’s there now: The Wynn. Fun fact: The D.I. was the last resort on The Strip to have its own country club and golf course, which later become part of The Wynn. Emotional impact: Medium. The local hang-out in Boulder City first opened as The Showboat back in 1954, but after changing names and owners, couldn’t keep up with the mega-resorts on The Strip. Fun fact: Legend has it, the resort used to hand out free cigarettes at the table games. How did it look: Wake up, sleepy. It happened in the dark at 2am. Emotional impact: High. The resort screamed "vintage Vegas" with an iconic sign, drive-in movie theater, and Wayne Newton, who became the first Strip headliner to make $25 million a year for a residency. What’s there now: The abandoned Echelon resort, which is now being replaced with the Asian-themed Resorts World. Fun fact: Howard Hughes actually tried to buy the place in '66, but was shot down by Uncle Sam because he already owned too many casinos. How did it look: Fancy. 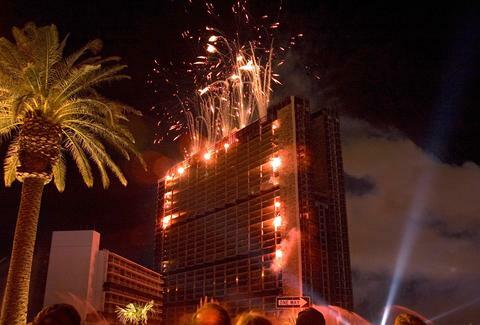 With fireworks creating a countdown on the side and the image of dynamite detonating before the implosion. Emotional impact: High. The second hotel ever built on The Strip and where Siegfried and Roy got their start. It’s also where Elvis first played Vegas and was famously panned by critics. What’s there now: An abandoned site from the company behind The Plaza hotel in New York. Fun fact: After the implosion, its sign near Las Vegas Boulevard stayed up for years until The Wynn across the street demanded it be taken down. Emotional Impact: Low. The Coney Island-themed resort was small, with less than 700 rooms. The best thing about it was the location – smack dab in the middle of The Strip. Fun Fact: The resort featured a roller coaster and ferris wheel... neither of which actually worked. Talk about a tease. Both were taken down before the implosion -- making the whole spectacle a lot less fun than it could’ve been.